The above tracks were probably made by a small arthropod like a trilobite. As sandy moist soil rapidly deteriorates, especially when dried, the tracks would have to have been covered quickly to preserve them. There may have even been some flow of water before or after the tracks were made as seen by the erosion mark in the middle of the track.Tracks of virtually all types of biological life forms with terrestrial appendages are found throughout the depths of strata and continents of the earth. These fossils support the concept of a watery muddy deposition of strata with biological life forms scurrying across the strata; with rapid deposition of further muddy strata upon the tracks to preserve them. This is consistent with them having occurred within a short period of time and upon the entire terrestrial earth (given that tracks are found throughout the continents and sedimentary strata of the earth). While this is conjecture as it was not observed there have been recent studies on track formation that support this idea. This is in concordance with the Noah Flood Account. Brand did studies looking at the formation of amphibian tracks on dry, moist, wet, and underwater sand. He concluded, "The laboratory trackways most similar to the fossil tracks were those made underwater. Underwater trackways had toe marks as often as the fossil tracks and were uniform in appearance the full length of the sand slope, as the fossil tracks are. Also, the proportions of the fossil tracks were most similar to the proportions of the underwater tracks. The sole impressions in the underwater tracks tend to be short in comparison to their width. The animals are partially buoyed up by water, and they often push against the :sand with their feet almost at right angles to the surface, rather than placing their feet flat on the surface. This produces tracks that usually have only toe marks or toe marks with a shortened sole impression ---features that are also found in many of the fossil tracks.The trackways...that were headed across the slope but with toes pointed upslope can perhaps be best explained by animals being pushed by a water current moving at an angle to the direction of their movement The hellbender, a short-tailed salamander, was the only animal used in this study that did not commonly make tail marks. Some of the known Permian amphibians were heavy-bodied, short-tailed animals. Perhaps this was at least part of the reason why the Coconino Sandstone tracks rarely have tail marks." See article online at button below. It should be noted that his view of how the tracks were made is still contested by those who believe the tracks were made on dry sand dunes. But that demonstrates part of the problem: if it wasn't observed it is impossible to prove one way or the other-as it was a past event. Yet current track making, underwater, is more consistent with the fossil evidence-at least to some. The Institute for Creation Research has presented a video in which they discuss a plausible way dinosaur tracks may have been preserved throughout the continental earth-in the past. They argue against the tracks being made in swamps-and provide evidence that it does not occur under conditions seen today. The observed data show the tracks to be in clayey soils, consistent to water born matter. This thickened muddy matter appears to have allowed and maintained the dinosaur imprints for short periods of time, hence the lack of erosion in track areas, before being covered by multiple muddy slurries afterward. The mobility of the large dinosaurs may have allowed them to escape longer in the Flood while the young dinosaurs would have be overcome earlier-hence few if any baby prints with adult ones. The observation that dinosaur tracks have been found on all continents of the earth is consistent with the earth having been entirely covered by flood waters at one time. 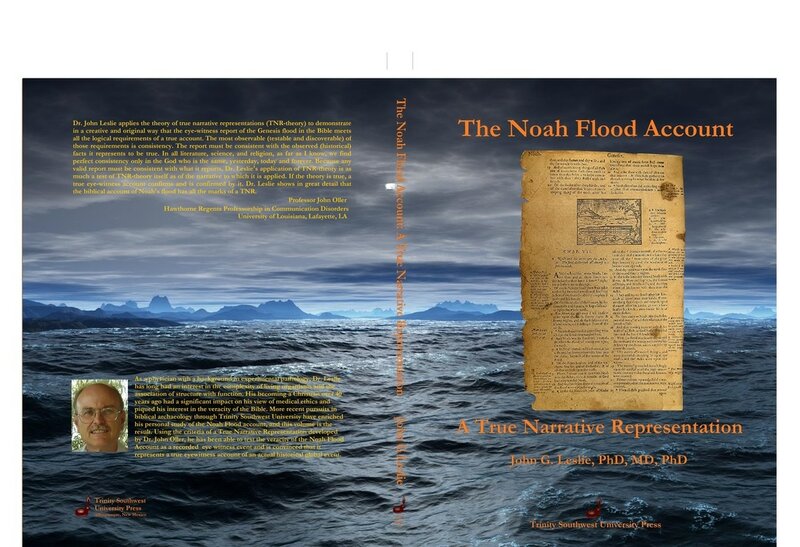 JGL comment: ICR seems to advocate a similar mechanism as myself in which massive amounts of muddy matter would ebb and flow over the entire land mass, which was one piece at least in the early to mid-Flood. Thus rapidly laid subsequent non-eroded as well as some eroded muddy layers would makeup the hardened stratified rock we see today; with dinosaur tracks and other ones preserved in amongst the strata. 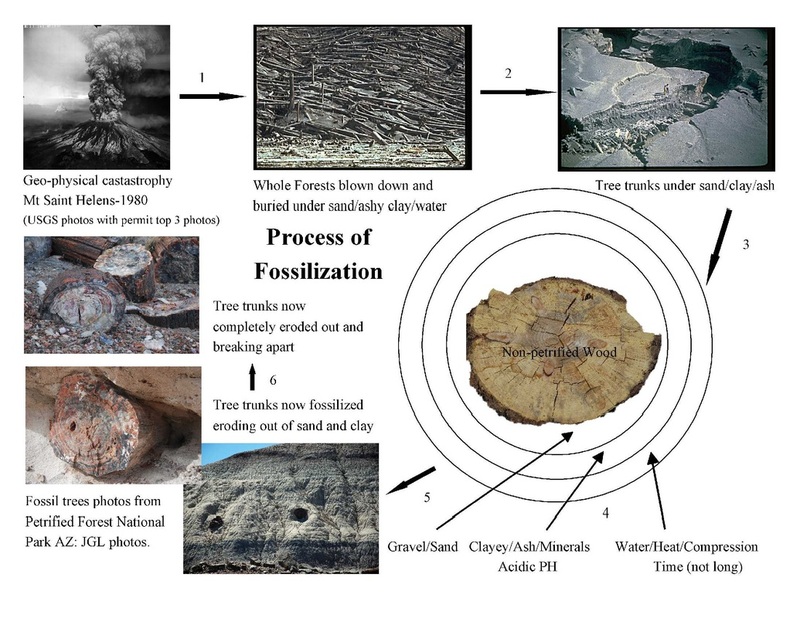 Below articles reported by Dr Andrew Snelling, a professional geologist, revealed how natural wood could be "fossilized" over a short period (within days up to 7 years- the limits of the testing) by having placed the wood in various solutions but which contained an acidic solution with silica and at a certain temperatures along with pressure in some cases. It should be noted that the wood became impregnated with up to 38% silica in one experiment. "In 2004, five Japanese scientists published examples of rapid petrification in Sedimentary Geology...analyzed a small lake in the explosion crater of the Tateyama Volcano in central Japan. A mineral-rich solution springs up from the bottom and fills the 15 m lake with steaming hot acidic water. This mineral-rich water then runs over the edge as a waterfall...They discovered that the naturally fallen wood in the overflow had been petrified with silica. What surprised the scientists was the fact that the wood was less than 36 years old. As a result, the scientists conducted an experiment in which they fastened pieces of fresh wood in the lake with wire. 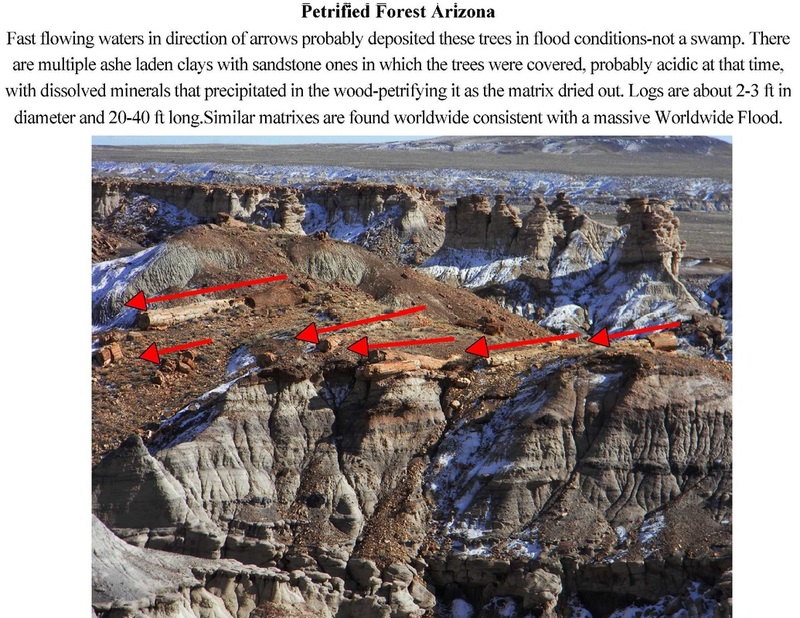 Surprisingly, after only 7 years the wood had turned into stone, petrified with silica..."
"﻿Artificial petrified wood has been produced in a Washington laboratory. In the process small cubes of pine are soaked in an acid bath for two days, then in a silica solution for another two. The product is then ﻿cooked ﻿at 1400 °C in an ﻿﻿argon﻿﻿ atmosphere for two hours. The result was ﻿silicon carbide﻿ ceramic which preserved the intricate cell structure of the wood." From Wikipedia article. Argentina – the Petrified Forest National Monument in Santa Cruz Province in the Argentine Patagonia has many trees that measure more than 3 m (10 ft) in diameter and 30 m (100 ft) long. 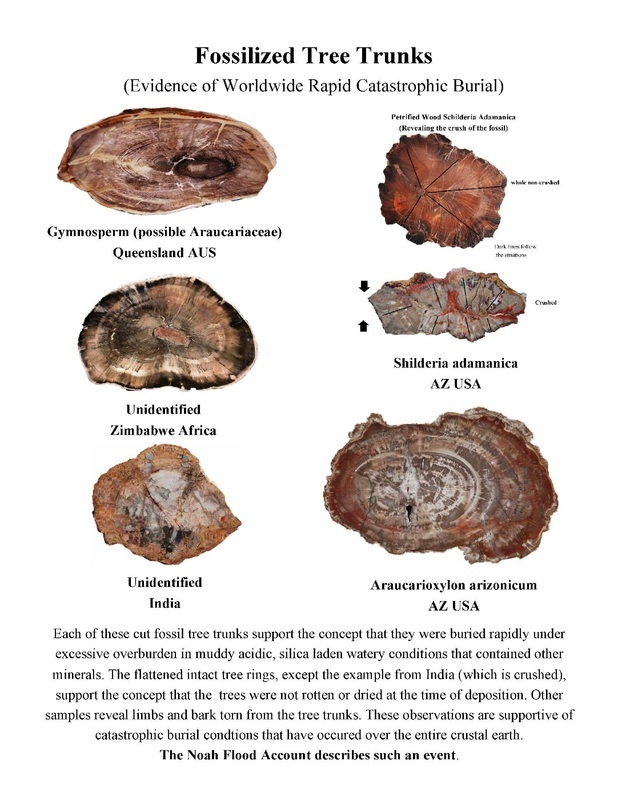 Australia – has deposits of petrified and opalised wood. Chinchilla, Queensland is famous for its 'Chinchilla Red'. Belgium – Geosite Goudberg near Hoegaarden. Brazil – in the geopark of Paleorrota, there is a vast area with petrified trees. Canada – in the badlands of southern Alberta; Petrified wood is the provincial stone of Alberta. Axel Heiberg Island in Nunavut has a large petrified forest. In and around the North Saskatchewan river, around the Edmonton area. China – in the Junggar Basin of Xinjiang, northwest China government has issued a crackdown on collecting of this material, but large slabs and even large meeting tables have been made out of the colorful petrified wood. Czech Republic, Nová Paka – The most famous locality on Permian-Carboniferous rocks in the Czech Republic. Germany – the museum of natural history in Chemnitz has a collection of petrified trees, from the in situ Chemnitz Petrified Forest, found in the town since 1737. Ecuador – Puyango petrified forest. One of the largest collections of petrified wood in the world. ﻿﻿Egypt ﻿﻿– petrified forest in Cairo-Suez road, declared a national protectorate by the minstery of environment, also in the area of New Cairo at the Extension of Nasr city, El Qattamiyya, near El Maadi district, and Al Farafra oasis. Greece – Petrified Forest of Lesvos, at the western tip of the island of Lesbos, is possibly the largest of the petrified forests, covering an area of over 150 km² and declared a National Monument in 1985. Large, upright trunks complete with root systems can be found, as well as trunks up to 22 m in length. 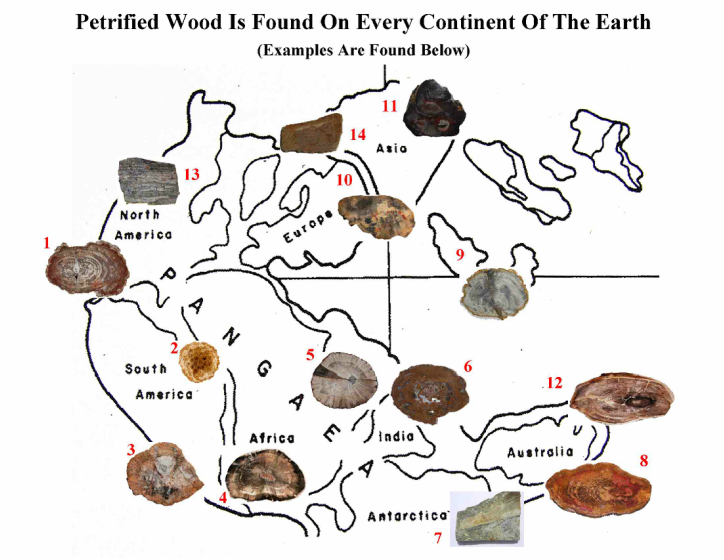 Indonesia – petrified wood covers several area in Banten and also in some part of Mount Halimun Salak National Park. India – a geological site known for its petrified wood Thiruvakkarai Village in Chennai, Tamil Nadu. The site is protected by the Geological Survey of India. Petrified wood covers a large area in this site. Israel – several examples of petrified wood occur in the HaMakhtesh HaGadol in the Negev desert. Curio Bay on the Catlins coast contains many petrified wood examples. ﻿﻿﻿United Kingdom ﻿﻿–﻿ many examples of petrified submerged forests can be found at low tide around the coast of England and Wales. Petrified Wood Park in Lemmon, South Dakota. Ginkgo/Wanapum State Park in Washington State. Petrified Forest National Park in Arizona. Petrified Forest (California) in California. Mississippi Petrified Forest in Flora, Mississippi. Florissant Fossil Beds National Monument near Florissant, Colorado. Yellowstone Petrified Forest, Yellowstone National Park, Wyoming. Gallatin Petrified Forest, Yellowstone National Park, Wyoming. The south unit of Theodore Roosevelt National Park outside Medora, North Dakota. Gilboa Fossil Forest, New York. Escalante Petrified Forest State Park in Utah. Petrified Springs in Kenosha, Wisconsin." "The Effects of temperature and press pressure on the anatomical structure of solid-wood panels produced by using Pinus sylvestris L. (Scotch pine) were evaluated." They took dried wood blocks and subjected them to pressing at a temperature of 120 or 150 degrees C. and a pressure of 5 or 7 MPa for one hour. 7 MPa = 1015 psi. By electron microscopy they showed deformation of the cell structure and a compression of the wood from 18 mm to 11 mm. Dogu et al. (2010) "Thermal compression of panels,"BioResources 5(4), 2640-2663. This study revealed that massive pressures are required to compress even soft woods such as a pine. How much more hard woods. As well, when the deformed laminar structure is maintained in the fossil form it argues that the deformation had to occur prior to rotting, brittleness, or un-deformed fossilization. It is consistent with fresh logs that were rapidly buried under tons of sediment and then the deformation process began. See Figure below for other factors involved. "Most people imagine that it takes millions of years to form sedimentary rock. That is certainly the impression we are given in our culture today. And because of that impression, many people dismiss the claims of the Bible, which describes Creation in six Earth-rotation days some 6,000 years ago. However, some Australian scientists have developed a revolutionary new chemical process that transforms loose sediment into rock within days.1,2 The invention does not use strange, synthetic materials, but mimics natural processes. Some may find it hard to believe, but it’s true. Contrary to the general impression, it does not take millions of years to produce sedimentary rock. All it takes are the right conditions." From Tas Walker Geologist-see link below. David, Thanks for the nice summary of non-fossilized tissues in dinosaurs. In my research degree I did some sequencing of part of a protein molecule, and latter some work with DNA. Great precautions had to be taken to avoid the degradation of the protein and DNA once the cells of the tissue of the organism start to be broken down. This occurred when the DNA or protein was being isolated from the tissue. Enzyme inhibitors, separation by different solvents, rapid freezing or drying, and molecular sieving had to be used to protect the DNA or protein. When I first heard of intact protein in dinosaur bone or joints, I was astounded. Even as a young age Creationist I would not have expected this. In my mind these data argue for a very rapid burial, which was massive (probably resulting in mostly anoxic conditions-without oxygen) for such large organisms, and that it was a recent event. This is of course consistent with the eye witness account described by Noah in the Bible. John Morris documents 42 different examples of animal tissues that did not fossilize using conventional geologic dating from 417 million years (chitin #34) to 10 million years old (bloody frog bone marrow #17). Other tissues included amino acids in amber insects (#4), hemoglobin fragments from T. Rex dinosaur (#7), muscle from salamander (#26), Mosasaur blood from the retina (#31), and even DNA from Hadrosaur bone (35). As mentioned above DNA and proteins are very susceptible to degradation especially in the setting of body tissues breaking down and releasing enzymes. See page 126 of his book The Global Flood. 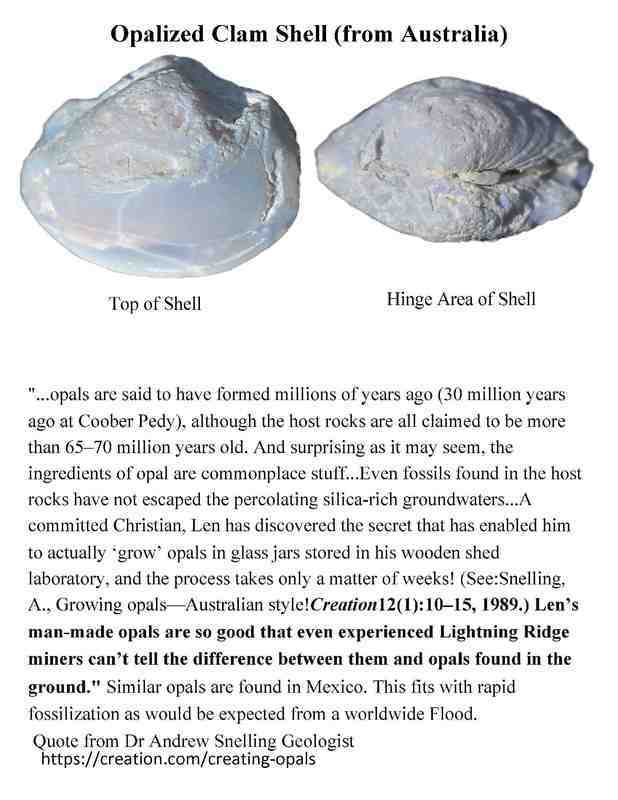 Soft Tissue Fossilization Evidence for Sudden, Extensive Destruction of Life Consistent with the Genesis Flood Account by Vera Everett on November 4, 2009 in Answers in Genesis. See link below abstract to go to article. Fossilization occurs rapidly when the conditions are right. The conditions necessary for lithification of soft tissue give clues to unlock the history of a fossil deposit. Experiments show that microbes are involved in the mineralization of soft tissue. By decaying flesh they affect the acidity of the environment and release ions necessary for its mineralization. Fossilization in apatite seems to require associated death and decay. In the Jurassic Oxford Clay Formation in England, apatite preserved the soft tissue of many squid-like animals, probably after a mass mortality event occurred in a zone of already high phosphate levels from decaying carcasses. Apatite has also preserved gelatinous embryonic cells that deteriorate in hours. The presence of these microscopic fossils in mud rock gives clues about the conditions in which the sediments were deposited and lithified. Broken shells and sand grains, found in shale that contain soft tissue fossilized in illite, have led some researchers to conclude that the creatures were buried quickly in pulses of a dense mud flow. 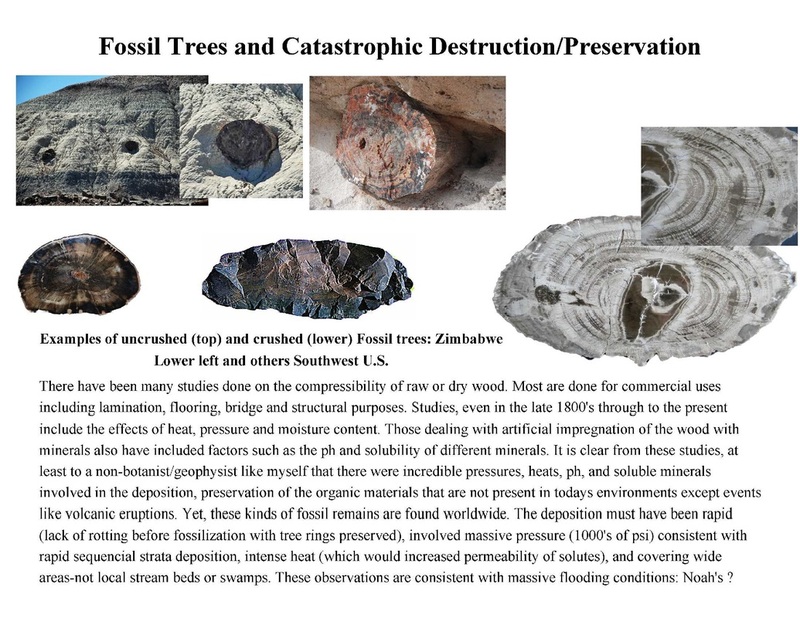 Soft tissue fossilization points to unusual conditions, conditions that are what would be expected in the sudden, extensive destruction of life, as recorded in the Genesis account of the worldwide Flood. In this book I present linguistic evidence for an actual eye witness account of the flood and also argue that it was worldwide in its impact. A link to purchase the book is below.